The heat transfer coefficient, referred to as the "u-value" or "u-factor", determines the amount of heat transferred through various building components. Since elements such as windows consist of multiple parts, each of these features its own u-value. Therefore, to effectively calculate the u-value of windows, the values of individual parts have to be considered first. Thermal insulation in windows is one of the most important aspects of any new building construction or renovation effort, and not just for reasons of building regulation compliance. Excessive heat loss through windows means a loss of heating energy, which is directly correlated to higher heating bills. Thus, optimising thermal insulation is not just necessitated by laws and regulations – it also has a positive financial impact. High u-factor windows are an important part of any thermal insulation strategy – after all, they are in direct contact with the outside climate. For this reason, they are the subject of continued insulation research and development. Insulating glass is one product of this research. It features an outstanding u-value only possible through the effective combination of the various materials used. However, since windows are always connected to wall elements, the nature of this connection is also of great importance. Insufficient insulation between windows and walls can render even the most advanced window technology pointless, since energy is easily lost via the resulting thermal bridges. Aside from windows, other building components can also cause heat loss to the outside, however. Even the most favourable window u-value cannot prevent heat loss resulting from insufficiently insulated doors or window frames acting as thermal bridges. The nature of the window frames used are as important to sufficiently high u factor windows as the type of glazing employed and the quality of installation. Of course, building walls should also be insulated sufficiently as well. The window reveal – the inside-facing surface of the window opening – is another important aspect of any heat insulation strategy. To avoid thermal bridges, this part of the building should also be insulated professionally. Each element used in the assembly of modern windows has its own u-value, with a third term being used to refer specifically to the u-value of the window in its entirety. The u-value determines the amount of heat lost through windows per m2 over the course of one hour at a temperature difference of 1°Celsius. Materials which transfer heat easily (such as metals) consequently feature a higher, less favourable u-value than isolating materials. The u-value is measured in W/(m2K). A lower u-value results in less heat energy lost through windows. Lower u-values represent better thermal insulation. Better windows lower costs by decreasing heat loss. The heat transfer coefficient of the frames and glazing, according to their relative proportions. According to the German quality assurance certificate DIN 4108, materials of ‘group 1’ – such as wood, uPVC or wood-aluminium composite – usually feature u-values of ≤ 2 W/(m2K). Accordingly, window frames made from these materials tend to feature worse u-values than more modern types of isolated glazing. Insulated glazing can offer great improvements to the overall u-value of windows. A coating of infrared-reflective material in combination with gases used in between glazing layers can improve the heat transfer coefficient of windows by 50% or more without deterring visual light. Unfortunately, special types of window glazing which combine multiple elements such as heat insulation; acoustic insulation or burglary protection usually cannot offer the same u-value as dedicated thermal insulating windows. Thermal insulation glazing elements featuring up to three panes of glass can reach heat transfer coefficients of 0,4 to 07, W/(m2K). improvements made to the glazing material would be moot because of the thermal bridges created by the less insulating frame. When renovating windows, the combined u-value of both frames and glazing should always be considered. Insulated types of windows featuring multiple panes of glass are highly efficient in terms of their u-value. One of the reasons for this is the fact that two or three panes of glass used in conjunction simply insulate heat better than single pane windows. Another reason, however, is the fact that insulated glazing featuring multiple panes of glass contains gas infills between individual panes. The gases used provide lower heat transference than air, which makes the formation of a heat bridge between individual panes of glass separated by such gases highly unlikely, positively impacting the u-value of windows built in such a way. The window spacers employed in the construction of modern windows are an important aspect of the insulating properties of windows as well. Spacers made from heat transferring materials – such as aluminium – can have a negative impact on the u-value of the glazing element. This is why modern spacers are generally made from highly insulating uPVC or high-grade steel which features better insulation capacities compared to aluminium. The resulting spacer system is often referred to as a “warm edge”. 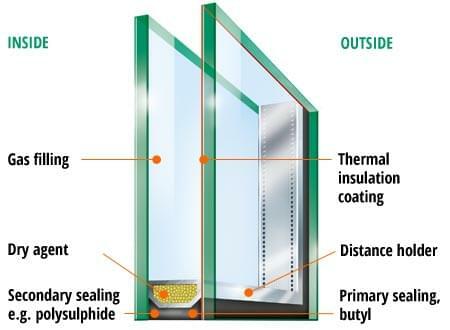 Insulating glazing combining multiple panes of glass can feature a u-value between 1,1 and 0,4 W/(m2K). Obsolete single-pane systems, in contrast, has shown u-values of up to 5,9 W(m2K). This is the reason why single-pane glazing is practically obsolete in building components, usually featuring only as part of the interior design. Another point to be considered in any u-value calculation is the surface area of the windows and their glazing element. Generally speaking, larger surface areas increase the u-value, negatively impacting the heat insulation abilities of such windows. Contemporary windows and walls are produced using a variety of materials. Window frames, for example, are available in wooden, uPVC or aluminium variants. Wood-aluminium compound systems are also available, combining the thermal insulation properties and visual aesthetics of wood with the sturdiness of lightweight aluminium. Wood has long been considered the best of all heat insulating materials for windows, though uPVC is considered to be its equivalent today, thanks to the use of special frame production and design methods. Modern uPVC frames are easily capable of reaching a u-value of 0,9 W/(m2K). Of course, walls should also benefit from modern advancements. In order to measure the u-value of a wall, all elements making up the bulk of its construction have to be considered. This means that the inner and outer parts of the wall have to be considered, as well as the insulating infill in between. Even outside plaster impacts u-value calculations, which is why special insulating plaster is available for interior walls as well as exterior ones. Such plaster can easily be applied during renovation. Old, even potentially hazardous, plaster is easily broken off walls and exchanged for new plaster. Historical buildings are particularly popular subjects of plaster renovations, since applying modern insulation methods to walls not originally built to thermal insulation specifications can be a daunting task. The new plaster, made from insulating materials, is applied as an undercoat to before the outer layer of plaster is applied. The outer layer of plaster, meanwhile, is usually resistant to the elements and allows for aesthetic independence from the looks of the insulating material. This method of plastering is of particular importance to historical buildings, allowing them to retain their original form. Meanwhile, on new buildings, the application method allows for effective thermal insulation while also allowing full control over the visual presentation of the house’s façade. Aesthetics might not be integral to saving money on heating bills, but they do make a building cosy, after all. Wood yet again provides the best heat insulation as a building material for walls, while concrete without additional thermal insulation features a particularly high u-value. Autoclaved aerated concrete is a particularly effective material whose u-value can reach even the average value provided by wood. Autoclaved aerated concrete is technically not a type of concrete, since the material is usually made from finely-ground steam-hardened sand. That being said, this particular type of concrete is relatively light and features a low density, making it an ideal material for interior or exterior walls. Despite providing excellent u-values on average, the material’s acoustic insulation abilities are inferior to most other materials. In areas with particularly heavy traffic, additional measures should be taken to provide for sufficient soundproofing. Acoustic insulating windows, for example, can easily be found at windows24.com, providing peace and quiet in any home. Heat naturally moves on its own, but homeowners should take measures to keep it where it is needed: in the inside of the house. Isolating windows and walls are initial steps to achieving this goal. However, the window reveal – the surface between walls and windows – should be insulated to prevent the forming of thermal bridges. High-quality insulating materials are capable of keeping warmth on the inside of the house while also preventing hazardous moulds from forming. Thermal bridges can create lower-temperature areas on windowsills which can draw water from the surrounding warmer air. Particularly in areas that are not regularly aired out, this can result in the formation of moulds. These might even migrate into the surrounding walls and potentially provide a significant health hazard for anyone living in the building. On top of this, mould removal is a particularly pricey and time-consuming process. Good thermal insulation on windows and regular airing-out of risky areas can prevent such a situation from occurring in the first place. This also applies to door frames, leafs and reveals, since their insulating properties work much the same. The roof area is of particular importance to any thermal insulating system. Today, vapour retarding elements are an important part of any roof construction. Vapour retarders are usually made of PVC foils used in conjunction with other thermal insulation elements installed in a roof. Such retarders are used to prevent air moisture from accumulating on the windows – though they can only function without impediment as long as proper thermal insulation keeps them warm. If this is not the case, moisture can form as usual. The same principle applies to the construction of skylights. Even unheated attics benefit from a well-functioning thermal insulation system, protecting a building and its inhabitants from accumulating moisture. Such measures effectively counteract renovation costs for windows installed in a roof. Ignoring insufficient skylight insulation in the first place can become a rather costly problem in the long run. To prevent water accumulation and excessive heat loss through skylights, the u-value of every single component should be considered prior to installation. To determine the exact u-value of your windows, all materials used must be accounted for. Only by correlating all individual u-values can the u-value of your window be calculated in its entirety. There is no single component of any window which should receive greater attention than others, since any component featuring bad insulation will automatically impact the insulating abilities of the entire window. Diligent work and effective thermal insulation systems employing high-quality materials are of utmost importance in new building construction as well as renovation. In the long run, both the environment and your personal finances will benefit greatly from the attention to detail put into your thermal insulation. Architects and professional builders can provide you with reliable u-value calculations for your windows, though understanding the physical principles behind heat transfer will allow you to use freely available information regarding material thermal resistances to calculate a u-value on your own. While it is always important to any homeowner to have an overview of all relevant aspects of their own home, a selection of professional building agencies can be found at windows24.com to support you in any building endeavour.